Do you believe in Zajick? The Met’s 2018-19 season begins in less than three weeks and “Trove Thursday” gives a preview of its opening night new production of Saint-Saëns’s Samson et Dalila with a broadcast featuring an unexpected temptress—Dolora Zajick—who will celebrate the 30th anniversary of her Met debut next month. As I was in town for the performance of Rameau’s Platée at BAM I mentioned last week, I caught a double-bill at the Met on October 8, 1988—Lucia in the afternoon with Edita Gruberovà and Francisco Araiza followed by Trovatore in the evening. All in all, the Verdi wasn’t exactly one for the memory books—Eva Marton urgent but inelegant and miscast, Luciano Pavarotti singing well enough but only occasionally remembering to play Manrico and Sherrill Milnes past his best. But the Azucena, nearly a decade younger than any of her colleagues, was making her relatively unheralded debut. I had already heard her earlier that year in the Rossini Stabat Mater at the Cincinnati May Festival, and needless to say, Zajick’s ringing and refulgent gypsy was a hit. The telecast the next week gave some idea of the impact the voice had in the house. 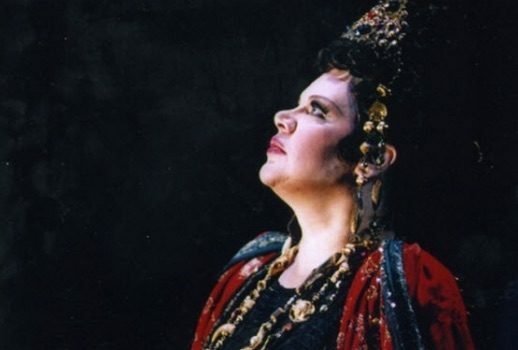 Later that same season Fiorenza Cossotto sang Amneris at the premiere of the still-in-use Sonja Frisell Aida followed by her final Met Azucenas. The timing was fortuitous: the stage was set for Zajick to become the Met’s go-to Verdi mezzo for the next three decades. She is scheduled to return to Amneris for the first time in over five years in January for the last go-round of the Frisell production—her possible Met farewell? Perhaps not–although she’ll be nearly 67 by that time she’s lately begun to take on character roles albeit with an uneven success rate. Her Countess in Pique Dame was commanding but not fascinating; she seemed unsure of herself as Mary in Der Fliegende Holländer; and her scary Gertrude last season in Hänsel und Gretel should have really been the Witch instead. But during the Holländer run she stopped the show at the Lincoln Center 50thAnniversary Gala with an electric “Acerba voluttà” from Adriana Lecouvreur during which the years fell away. Anita Rachvelishvili, her possible successor, will have her work cut out on New Year’s Eve to top her senior colleague’s blazing rendition. Zajick’s Verdi quartet—Azucena, Amneris, Eboli and Ulrica—have accounted for the majority of her over 250 Met performances but there was also Marfa in Khovanshchina which I missed and Adalgisa in Norma which I made a special effort to catch when that dreary John Copley production was revived in 2007. Perhaps no one since Ebe Stignani has looked less like an innocent vestal but Zajick sang with a finesse and purity that was quite astonishing and, like many Adalgisas, pretty much left the evening’s routine high priestess in the dust. Another successful instance of Zajick-virgin-casting was her impressive Joan of Arc in Tchaikovsky’s Orleanskaya Dieva at Carnegie Hall in 2007 while her delightfully cackling hag of a Jezibaba commandeered several runs of Rusalka at the Met for over twenty years. But it’s unfortunate we never got to hear her as Lady Macbeth, Leonore in La Favorita, Zia Principessa in Suor Angelica or Ortrud, among the roles she sang elsewhere but not in New York. September 24 will be the fourth time Samson has opened a Met season; the first two during the 1910s featured Enrico Caruso. The third transpired almost exactly 20 years ago when during the live telecast Placido Domingo cracked on a high note in the final act; that fluff was immediately and controversially “adjusted” on rebroadcasts and the now out-of-print video release. Absent for over a dozen years, opera’s Cecil B. DeMille moment returns with Elina Garanca and Roberto Alagna in Darko Tresnjak’s production with another equally seductive half-Latvian pairing of Rachvelishvili and Aleksandrs Antonenko taking over in February. Samson can be downloaded by clicking on the icon of a square with an arrow pointing downward on the audio player and the resulting mp3 files will appear in your download directory. Many other “Trove Thursday” podcasts remain available from iTunes for free, or via any RSS reader.